SlimeGUARD Spray is use to keep your ice machine slime-free! After sanitizing, SlimeGUARD Spray is spritzed onto all non-evaporator surfaces inside the ice machine (metal and plastic) that are not in continuous contact with the water in the machine. 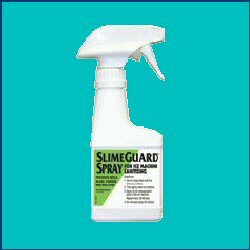 SlimeGuardÃ‚Â® Spray will dramatically reduce slime related maintenance and cleaning. Apply every 30-60 days for best results. Order through us for discounts and to eliminate Handling Charges.